Over the past few years, I've had a number of clients experience dramatic improvement with a wide spectrum of health challenges by adding bone broth to their customized regimens. 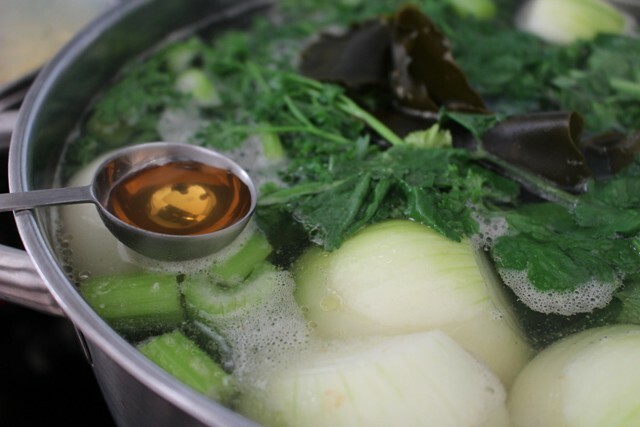 Osteoporosis, digestive challenges, intermittent muscle cramping, systemic nerve dysfunction, chronic joint pain, and weak hair and nails are just a few of the many ailments that I have found to respond well to regular intake of properly made bone broth. Bone broth is abundant in easily absorbed minerals - calcium, magnesium, phosphorus, silicon, sulphur and a number of trace minerals, all of which help ensure optimal nourishment and function of your musculoskeletal and nervous systems. Gelatin that is abundant in properly made bone broth nourishes the structural matrix of all of your bones and teeth, which allows for optimal strength and flexibility. Bone broth provides glucosamine and chondroitin sulphates that give substantial help to joints that are suffering from deteriorated ligaments. Perhaps the greatest benefit of regular intake of bone broth is improved gut health and protection against leaky gut syndrome. 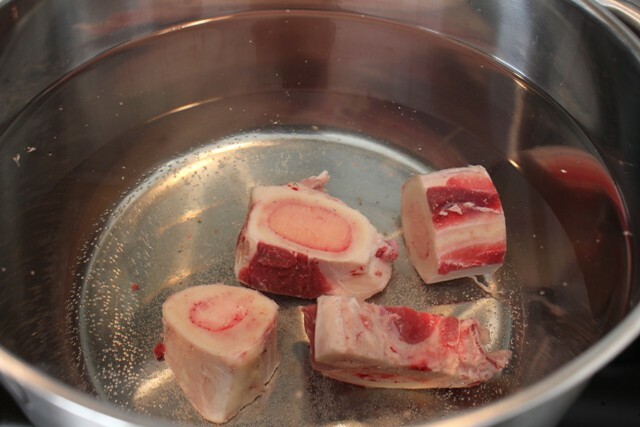 Components of cartilage found in bone broth support immune system function by activating different types of white blood cells and promoting proliferation of white blood cells as needed. 1. 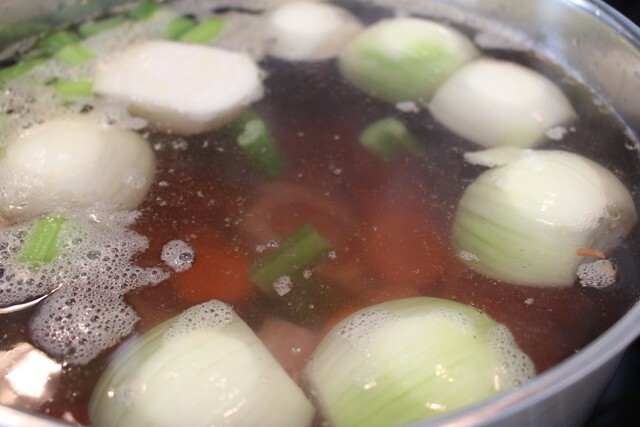 Fill a large stock pot with cold water - about 4 liters is what works well with the quantities noted above. Add all ingredients and bring to a boil. 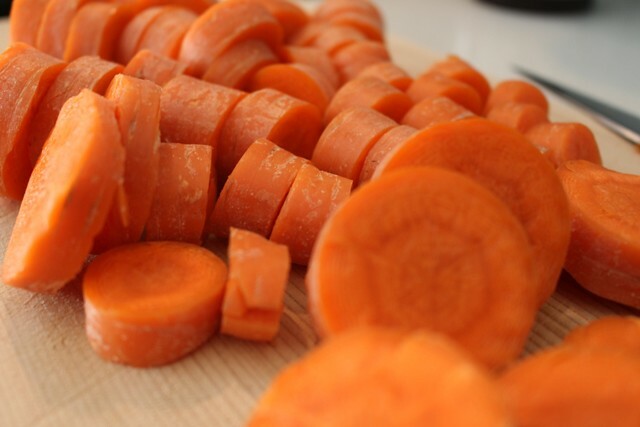 No need to peel your carrots, just give them a good scrub under running water and a rough chop into bite-size pieces. 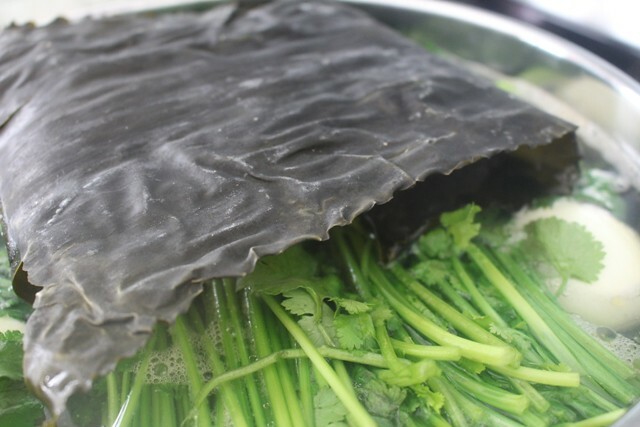 This is what dah shi ma seaweed looks like. 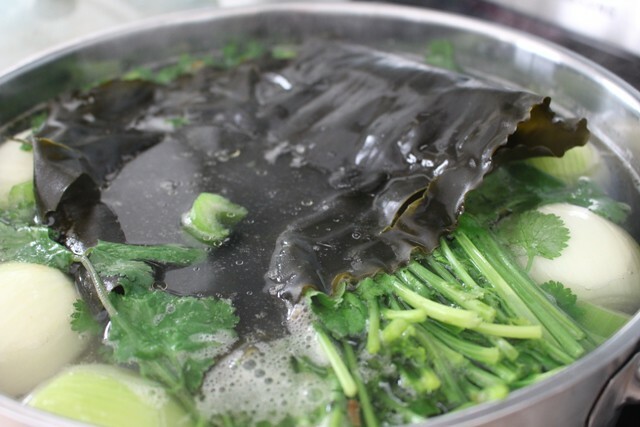 It's also called kombu kelp. 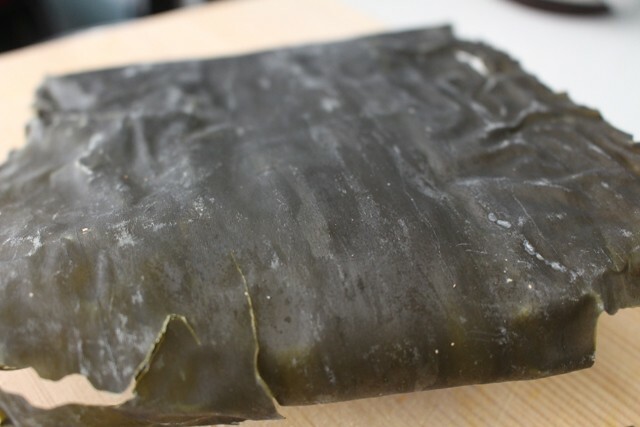 It's rich in a number of minerals, including calcium and iodine. If you don't have easy access to dah shi ma, it's fine to go without. 2. Within the first 15 to 20 minutes, you'll notice some impurities float to the surface of your water. You can remove these bits of matter with a fine mesh strainer. 3. 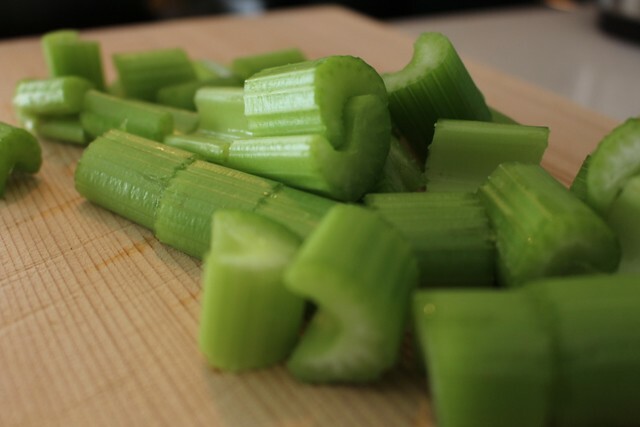 Let your broth simmer for 3 to 8 hours and then cool for an hour. The thicker your bones, the longer you want to simmer. Fish bones only require about 3 hours of simmer time; chicken bones about 5 hours, and beef bones around 8 hours for optimal extraction of nutrients. 4. 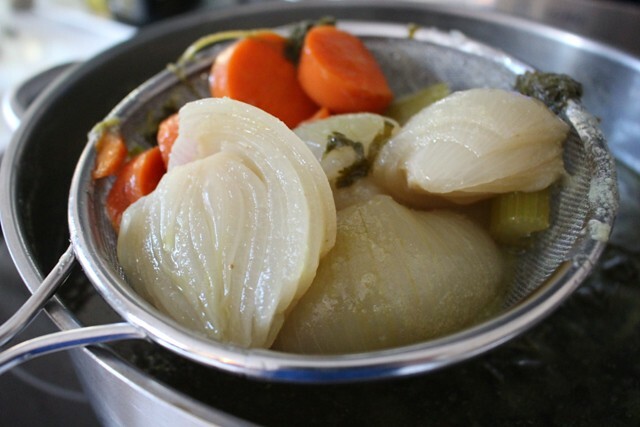 Use a strainer to scoop the solids out of your broth and use a slotted spoon or spatula to squeeze as much liquid goodness as you can out of your overcooked vegetables. 5. 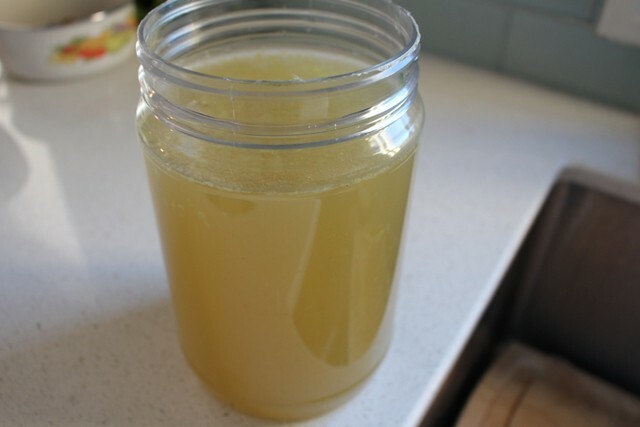 Transfer your nutrient-rich bone broth to air-tight containers and store in the refrigerator. You can use your bone broth for soups, stews, and even heat up a mugful at a time to sip like you would tea to continuously infuse your body with the many health-enhancing nutrients in homemade bone broth. But please keep in mind that bone broth is more nutrient-dense than vegetable broth. And it's the gelatin in bone broth that makes it uniquely beneficial to gut, joint, and bone health. 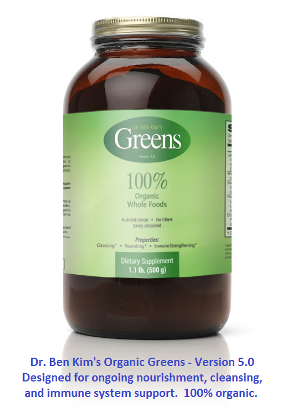 The more gelatinous your bone broth is, the more nourishing it is to all of your organ systems. 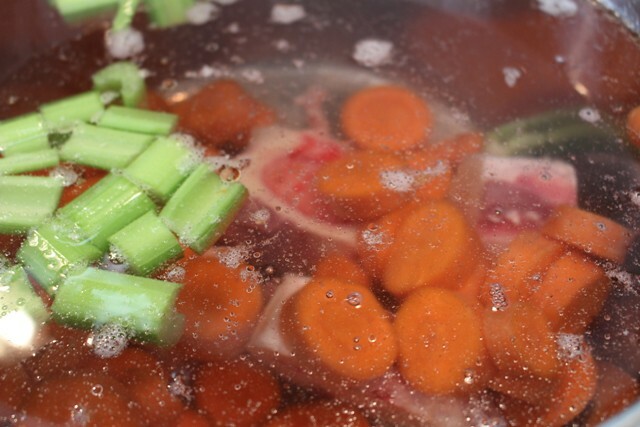 How long does the bone broth keep in the fridge? Can you freeze it? Bone broth freezes very well. In an air-tight jar, I find it's fine to keep in the refrigerator for a week. It also freezes very well. I am trying to heal a torn meniscus. Before I contacted you, I had thought that bone broth was the thing to try to avoid surgery. You confirmed my thoughts. Thank you. I do not have access to the seaweed, but plan on using beet leaf greens & possibly mustard greens (both have vit. K...good for new cartilage growth) & plantain leaf (for inflammation and tissue regeneration) to my broth along with beneficial herbs (rosemary & thyme to increase circulation; & sage...but I don't remember why I chose that). I will be making a LARGE stock pot full as I usually do, with the only new addition being the greens. It only makes sense. I will let you know when I notice results or if the future MRI shows healing...which I hope it will. I like your plan, Laurie! Hi Laurie, I read your comment with great interest and am curious as to whether you add the plantains to your bone broth, also do you use the broad leafed or narrow leafed plantain. 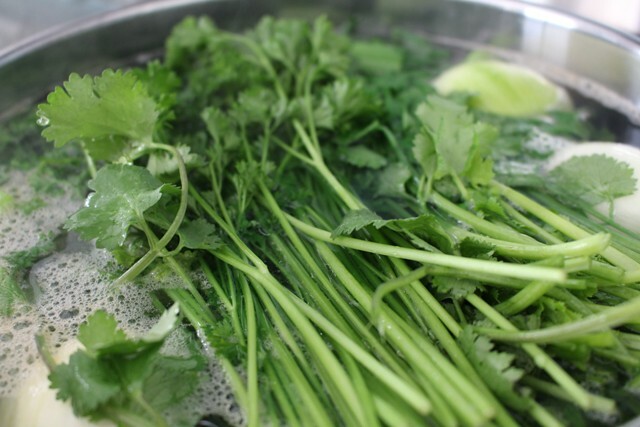 Regarding the herbs you mention do you add them to the broth or make separate herb teas? I have poor circulation ( muscle spasm ) and suffer from chronic inflammation. I have been told by a neurologist that I need surgery for carpel tunnel as I have nerve damage resulting in 'pins and needles' in my hands. If I could avoid surgery, I would do whatever it takes. From what I understand, both have the same properties. Since broadleaf grows here, I would be using that myself. Actually, I am drinking it in tea form at the moment as I got it after I made the broth. I could not find mustard greens unfortunately. I did put those additional herbs in the broth, but I suspect that they would make a nice tea as well. As for carpal tunnel, I had that. I would not go to a doctor as I knew that they also would have recommended surgery. I also read that carpal tunnel returns in most cases. 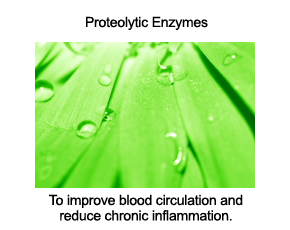 What I found to help at the time was supplemental vitamin B6 as it helps reduce inflammation. A good bone broth will have this. I did not know about bone broth's great healing powers at the time, or I would have tried that too. I found some good exercises to do online, but I can no longer find the right link to share it with others. I also had acupressure done for my carpal tunnel. There is TCM and a western version of acupressure, which are quite different. At the time, I did not have the TCM available to me. I hope you find relief. Carpal tunnel is not fun. Muscle spasm, needle pins in hands, carpel tunnel.. I've been told the sameby neurologists. But an accidental visit to areflexologist in Singapore solves most problems. Back to the US, I ran into acupressure teaching on the Asian Utube. My fingers can barely open, pins and needles...If you use your hand, grab your thighs and pull up , the top of your thighs, and move inch by inch from your hip to the knee and repeat again. Do it with both hands if you wish. Your thighs will bruise , hurt a lot but it doesn't matter. Blockages are clearing. Grab as much as your fingers allow. Try for a week. And see that the blockages will be gone and your hands will be normal. You have to try to believe. No side effect. It takes work . And your body will heal. Just try. I learned it from a monk who used to be an acupuncturist. Thank you so much for your great recipes. Is there a way to print them without the photos? I would just copy paste to word and print. Hope this helps. In the past I have used http://www.printfriendly.com/ then copied & pasted into another computer program to change font size to save on more ink and paper if desired. PF works very well. Bone Broth - daily recommendation amount? Hi Gina - it really depends on individual circumstances. If you are going about a regular day and eating as you normally would, I would aim for two cups (about 6 to 8 ounces each) daily. I have had some clients making recoveries from major surgery and/or chronic illness take this broth as their main source of liquids - in such cases, they would drink 6, 7, 8 mugs of broth daily. As with everything else, you want to try what makes sense for your situation, observe how your body responds, and make modifications if necessary. Does it matter what type of bones? Some Bone broth solidifies into jelly, others do not. I assume some bones contain more gelatin or cartilage? Can you suggest the best bones to use? Thanks!! Yuliya- beef, chicken, fish, lamb, and even pork bones all work well, in my experience. If you want to increase gelatin content, simply add some chicken feet to your stock. I've seen recipes that roast the bones first or boil the bones and throw out the first water. Are these steps unnecessary? Hi Shareen - I have never followed either step you described. But I'm sure there are many ways to make nourishing bone broth. If you've never made bone broth, I would suggest following the steps listed in this pictorial. You can always experiment with subsequent batches. Roasting the bones will only give the broth a richer taste. It does not improve the nutritional content of the soup. Would it affect the nutrition value of your bone broth, or other foods, if you cook it in a pressure cooker? I feel it is fine to use a pressure cooker to make broth. A crock pot would be even better if you have one. What do you do with the vegetables? We usually compost ours, but you could always use them in blended stews. How long does the broth keep fresh in the fridge? I made a batch 3-4 weeks ago and forgot about it, can I still drink it? Great question. In an air-tight jar, it's typically fine up to a week, give or take a day. I put bone broth in fridge and allow the fat to harden at top, then scoop it out and throw away the fat. What do you think about this? Most of that material offers health-enhancing benefits - I would keep it; once you heat up your broth, it will become liquid. What is your system from taking the hot pot of broth and transferring to individual containers? Does the broth have to be cooled before pouring into a glass mason jar? Do you have a system for cooling? Thanks! We let ours cool on the stove-top until it is lukewarm before transferring. Could I eat chewable snapper fish bone? I pressure-cooked for two hours at the highest pressure snapper fish bone broth following your recipe. The fish bones after cooking are so soft that they break when holding them with fingers. Is it safe to swallow these chewable bones? Are they a good source of calcium just like canned sardines? I'm not quite sure - I would imagine that a small amount here and there would be fine, but I likely wouldn't eat them daily. Too much calcium would put unnecessary burden on your buffering systems, as well as your genitourinary system, and ultimately, your blood vessels could also be affected. 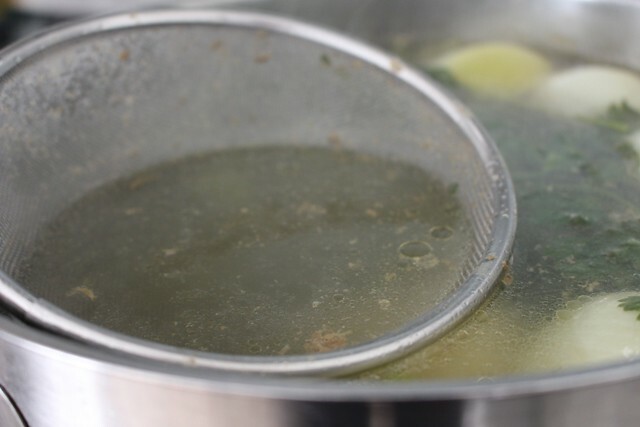 Will heating the bone broth in the microwave damage the nutrients in the broth? Stephanie - the nutrients are largely intact even after microwaving broth. 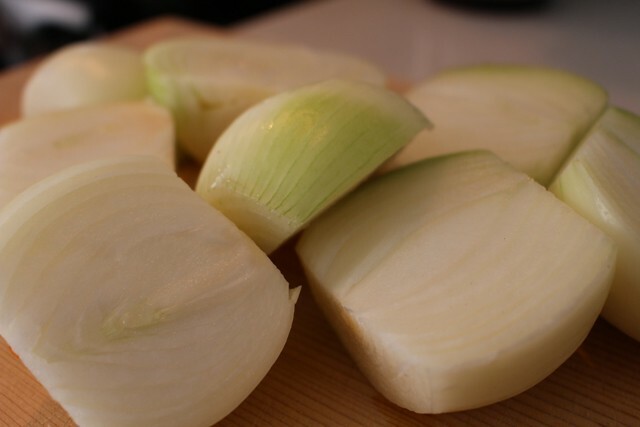 Broth supplies mainly a wide spectrum of minerals and fatty acids that are not heat-sensitive. My mum has Lupus which affected her low blood platelet. I remembered one of your article mentioned to avoid animal protein or too much protein if we want to beat auto-immune diseases that maybe caused by the gut. Is it beneficial for her to drink bone broth on a daily basis in this case?